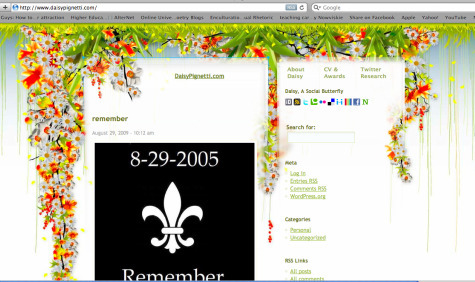 Daisy Pignetti writes a blog I feel a special connection to because she and I blogged our way through Katrina together from different places and different perspectives. A New Orleans native, she continues to write about Katrina and recovery issues. She’s also very interested in social media and provides some great ideas for using Twitter and other social sites in the classroom. She uses WordPress and has a gorgeous and aptly chosen WordPress theme. This work by Sharon Gerald is licensed under a Creative Commons Attribution-Share Alike 3.0 United States License.